Lose weight with BIKI®, the simplest, fastest diet app available. Choose how to track: (1) Use food photos to track custom meals in just 1-click (2) Follow your customized diet plan (3) Or use your interchangeable diet tracker-nutrition adviser. With expert insight about your personal diet habits (PRO only) you'll learn exactly how to fine-tune your eating habits and with a flexible custom diet you'll be able to create your own perfect custom diet plan. 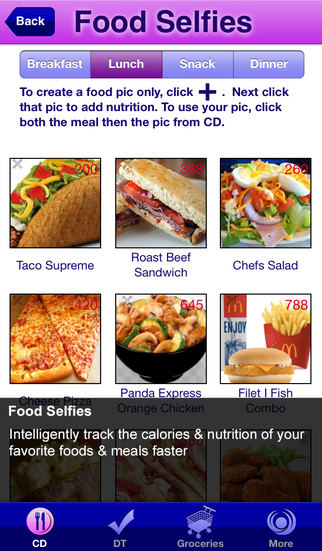 Use Food Selfies & other exclusive diet tools to create a more hassle free - fun to follow diet. Everyone begins by registering and using BIKI® LITE; then depending upon preferences and needs upgrades to BIKI® PRO, which once updated, includes full access to Food Selfies tracking as well as the MORE page which includes ALL the diet and support options our dietitian recommends. A registered dietitian specializing in weight and health related weight issues. -- "Hi. I wanted to let you know that I am losing weight easier than ever before on my new eating plan. I have lost 16 pounds without any feelings of hunger. " -- "P.S. This eating program is wonderful. I've completely changed my eating habits in only 2 weeks and I don't even crave some of the unhealthy foods that I used to!" BIKI was designed for women and men (18+) who want to lose weight and improve health. The diet is very flexible, practical, user-friendly and intuitive; simply add and delete foods or custom food photos and/or use the dietitian’s diet. -Your Individualized, Custom Diet: diet type, restrictions and lifestyle are used to create your individualized, custom diet BIKI. Track the foods you eat at meals, totals meal nutrition, get advise regarding your consumed v.s. advised totals as-you go. Depending upon your needs you can choose to use just the calorie counter/tracker or use the custom diet or both interchangeably (BOTH). BIKI® is a practical, easy-to-use diet that works! It's based on years of objective client-centered testing.